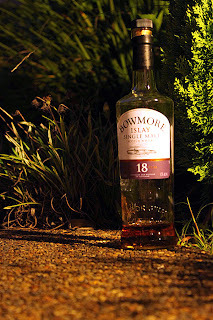 As someone who is not generally a purchaser of Bowmore whisky, I was completely surprised at tasting this Bowmore 18yo at the 2010 Whisky Live. I was so taken with it that I purchased this bottle immediately. It’s a 43% whisky and it appears to have won a Best in Show award at the 2007 San Francisco World spirits competition. Colour : Syrupy dark brown. Much darker than your average whisky. Nose: Very sweet molasses. Picture the aroma you smell being in a sugar mill. A real wow factor for me. Typical Bowmore mustiness or pungency present. Taste : Nice chocolate flavours dominate. Mellow spicy fruit as well and my mouth tingles slightly. The flavours settle in the back of the mouth. Not so much taste in the front or middle palette. Not one for the cigars as the soft chocolate flavours would be overpowered completely. Finish: Medium finish subsiding relatively quickly. Whilst not a long finish the chocolate flavours can still be tasted in the mouth and are extremely pleasing. I really rate this whisky and have enjoyed it immensely. It has been an effort not too consume it too quickly. If you’re a Bowmore fan you will love this whisky as it does contain that pungent mustiness I find distinct to Bowmore. But it also contains something different which instantly attracted me and if you are ever able to try some I highly recommend. I rate it 6 out of 7 lightning bolts.